Now available to all RebelMouse users, you can create a custom header image. By default, your header is just your profile picture and your site name. The header width is 1043 px, but images that are at least 600 px are acceptable. The minimum image height is 187 px. The tools for uploading and sizing your image are fairly user-friendly, with ample opportunity to crop and resize your photo after you upload it. Log in to your RebelMouse account. On the front page, roll your cursor over the header image. A small Edit Header Image button (it also bears a pencil icon) appears next to your profile photo and the name of your RebelMouse page. Click the button to edit your header image. 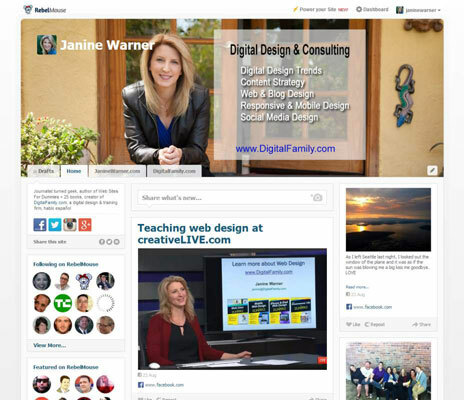 Use just your site name and profile photo (or avatar). Add a large header image. Select the Add Large Header Image radio button. A panel opens where you can upload and do basic sizing on your chosen image. Navigate to and upload your image. For an image stored on a device (your computer, a thumb drive, and so on): Click Upload an Image, navigate to where your image is located, and then click Open. For an image from another social media site or that appears elsewhere on the web: Click Upload from URL and then enter the URL of the photo that you wish to use. The photo you choose appears in the central panel. Click and drag the handles at the corner of the screen to crop and choose the area of your photo that you want to appear in your header. Width: RebelMouse suggests that a header image be at least 1043 pixels (px) wide, but images of only 600 px will also work. A smaller-resolution image may look pixelated or distorted when viewed full-size in the header. Height: The minimum recommended height is 187 px. However, the RebelMouse design will accommodate images that are much larger in height. Just drag the sizing handles to expand the working area to include the areas you want to appear. Click the Done Cropping button. 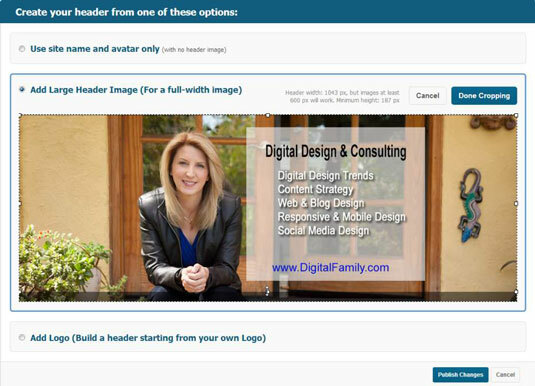 Your header image will appear as your site visitors will see it. If you don@’t like how it appears, click the Recrop button in the upper right and repeat the process. You can now choose whether you want the name of your site and your avatar (basically, your portrait photo) to appear on the final RebelMouse header. If the image you chose for your RebelMouse site already includes the site name and identifying information, you can choose to omit these two items. Otherwise, they will show up by default. (Optional) From the Site Title field (you may need to scroll down to see it), change the title of your site. (Optional) Open the Text Color drop-down list to change the color of the text. Try to choose a contrasting text color. That is, if you have a photo with a dark area in the upper-left corner, where your avatar and site title appear, choose a light color so that it shows up better (and vice versa). Click the Publish Changes button (lower right) to see your creation. Your new RebelMouse header appears at the top of your page.